Fascinating Rhythm – Fantastic Result! FR now 5th placed in the UK. Fantastic Result! FR now 5th placed in the UK. Posted 04.11.2015 by Fascinating Rhythm & filed under News. We had the most fantastic time at our Annual Convention in Bournemouth over the Halloween weekend and are so, so pleased to have jumped two places up the rankings with improved scores (they maybe tiny, but they count) with consistency across all three judging categories. All choruses have to work harder and harder each year to cling on – there are currently 8 choruses scoring between 70.1 and our 74.1, so we know we’ve got our work cut out for next year. The dazzling scores of our top chorus, the fabulous White Rosettes at 83.4, gives some idea of just how good they are and the gap we’re trying to bridge. And biting their ankles with 82.2 is Amersham A Cappella – so nobody will be resting on their laurels. This, our 20th Anniversary year, has been full on – first with our very successful show in June which really stretched us; we learned so much from it (apart from 6 new songs in as many months! ), and then working with such commitment to achieve a decent convention result. We are truly indebted to our excellent and awesome Coach, Sally McLean, who encourages us to believe in ourselves yet still maintain a sense of humour. 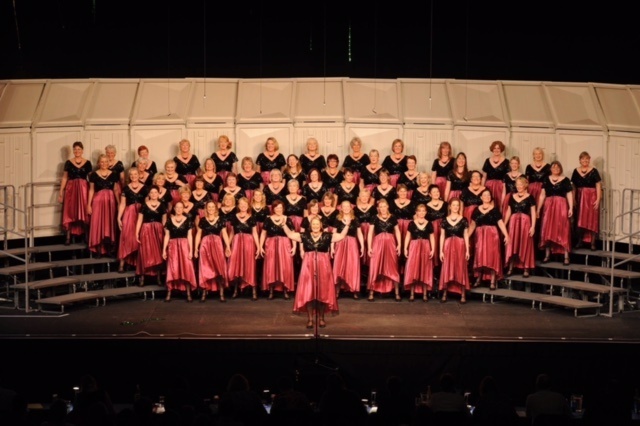 We’re now looking forward to a joint Christmas Show with the Great Western Chorus – 2015 Gold Medal Champions. What a cracking way to finish off 2015!